Fabulous Floral Wedding Invitation Bundle + An Added Bonus! 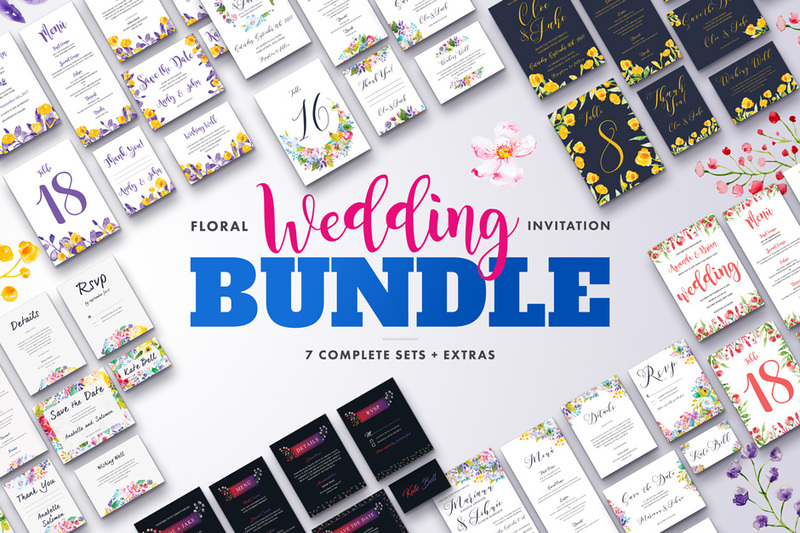 The Floral Wedding Invitation Bundle is a collection of 7 lovely and fresh looking invitation sets, perfectly balances refined typography and expressive watercolour florals, perfect for any style of wedding, that will save you tonnes of work. Each set includes: Save the Date, Invitation, Menu, Details, Place Card, RSVP, Table Number, Wishing Well, Thank You. The templates are print ready. All text and font colours are editable. Simply replace the text with your own information. All elements are on their own layer. The colour of the watercolour elements can be modified by changing the hue. All fonts used are 100% free. Please note this pack is to only be used for personal use. File size is approx 1.52GB (1.83GB unzipped), offered as a single download.